One of the non-beer related blogs I've been enjoying for a couple month's now is Alyson Thomas's Meat Sections blog. The concept for her blog is amusing to say the least. Each day, Alyson draws/paints an illustration/painting in the style of a butcher's meat section diagram (you know the type - here's the loin, here's the roast, etc). But the subject matter of each piece can be very different and she really lets her creativity run loose with it. I'm a big fan of the beers coming out of The Bruery (Placentia, CA), so I was stoked when Alyson chose to do a piece inspired by The Bruery's Melange No. 6, which she tasted during the 2010 San Fransisco Beer Week. 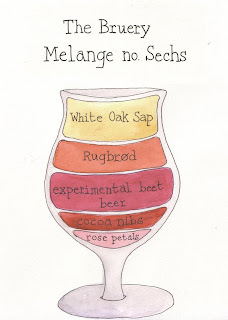 The Melange Series is The Bruery's one-off, experimental beer line, with the sixth installment being a potent ale with all the the ingredients displayed in Alyson's illustration. If you happen across any other amusing beer (or food) artistic websties in your travels through the internet, please let us know!